Meadhall is another of the restaurants that has cropped up in Kendall Sq. It is a gastropub with a large beer selection. People who know much better than I do, tell me it’s a great beer list. Despite MIT’s graduation was earlier in the day, my dining companion and I were able to get a nice table by the windows at 7:00pm on a Friday night. Several of the reviews I read talk about the noise level, but we were able to carry on a conversation without much trouble. 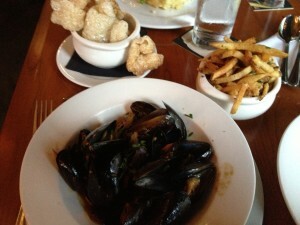 I had Moules-Frites (I know, predictable); medium sized mussels were steamed in Abbey ale, onions and chorizo. It was technically an appetizer ($12), but the serving was generous enough that I was satisfied with it as my entrée. The mussels were tender and I enjoyed the broth, but there needed to be more of it. The fries were excellent – crispy and well seasoned. I also got a side order of the BBQ pork rinds, which desperately needed salt. My dining companion had the Belgian ale meatloaf ($18). He said he liked it, but didn’t offer me a bite, so I can’t tell you anymore about it. He also failed to eat the single large onion ring garnish. I watched it longingly as the waitress whisked the plate away. Our server was proficient and the prices are reasonable. I think it’s a nice after work location to grab a drink and an order of fries.